Reuters – Twenty schoolchildren surround a city bus in central Bangkok. Some get on to confront a 16-year-old from a rival school and, within moments, he is shot dead. Similar altercations have become a focus of public attention, with shootings affecting seemingly ordinary folk. In one incident at a busy intersection, a computer repairman shot dead two people and took a third hostage. Witnesses said it resembled a scene from a Hollywood blockbuster. A tourist haven and regional base for multinational companies, Thailandhas the highest number of guns in civilian hands in Southeast Asia — almost four times more than the Philippines, a country notorious for violent gun crime. 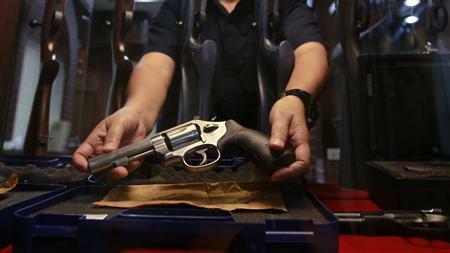 Some blame the rise in gun crime on political instability that has gripped Thailand since a 2006 coup that removed Prime Minister Thaksin Shinawatra. Unrest culminated in a two-month stand-off in 2010 between government troops and “red shirt” protesters backing Thaksin and clashes that killed 91 people. Others say that the seeming impunity enjoyed by the wealthy has prompted some to take the law into their own hands. Chuwit never owned a gun before this year. He now has three. Escalating gun crime could put off companies looking to set up in a country that prides itself on its friendly image as the “Land of Smiles” and is recovering from devastating 2011 floods. It could also further dent the idyllic reputation, already hit by crime directed against foreign visitors, that will draw some 20 million tourists this year, a mainstay of the economy. Recent incidents include a senator who fatally shot his ex-wife over Sunday dinner, a nightclub shooting spree that left five dead, a Gangnam Style dance-off between rival gangs –inspired by the popular Korean song — that degenerated into a shootout and 10,000 bullets found at an apartment owned by a former deputy provincial governor. All this underscores a growing sense of lawlessness since the 2006 coup. Gun crime in Bangkok has more than doubled and the new police chief, described by a deputy prime minister as a “thug-catching type”, has vowed to take weapons off the streets. Thailand has the highest gun murder rate in Asia, according to http://www.gunpolicy.org, a site hosted by the University of Sydney’s School of Public Health in Australia. There were 5.3 murders by firearms per 100,000 people in Thailand in 2011, compared to 0.2 in the Philippines, the United Nations Office on Drugs and Crime reported. Six years of confrontation pitted the yellow-clad, royalist People’s Alliance for Democracy against the “red shirts”, the United Front for Democracy Against Dictatorship, broadly loyal to Thaksin and his sister, current Prime Minister Yingluck Shinawatra. “Years of political upheaval have encouraged criminal activity because dirty dealings are easier to hide when the focus is on politics and not crime,” says Chankhanit Suriyamanee of Bangkok’s Mahidol University. Political appointments bring fresh pledges to tackle crime but these are often shortlived, says Chankhanit. Under Thai law, people under 20 cannot own a gun and strict background checks must be conducted before licences are issued. Despite this, the number of young people carrying firearms has increased 32 percent over the last nine years, says Thailand’s Justice Ministry. Nestled among the lanes and alleys in Bangkok’s bustling Chinatown is the Old Siam Plaza. Around it, some 80 gun shops operate legally — some advertise guns with their serial numbers scratched off. Officials, police say, are part of the problem. All Thai government employees are entitled to buy guns at a discount. Some officials declare the weapon lost and sell it on the black market for up to the equivalent of $2,600, says police chief Khamronwit. Others accept bribes to grant licences quickly, says Chuwit. According to Interior Ministry records, 6.2 million licences have been issued in a country with a population of 69 million. Over 1,100 km (700 miles) away from Bangkok, in the country’s three southernmost provinces bordering Malaysia, a Muslim insurgency that reignited in 2004 brought with it raids by suspected insurgents on army weapons depots. Police say the raids play a small part in the plethora of weapons flooding the domestic market. “Guns are coming through all of Thailand’s borders to the north, east and west of the country,” said Supisan Pakdinarunat, Commander of Thailand’s Crime Suppression Division. In October, Malaysia’s home minister blamed increased gun use in his country on smuggling across the Thai border. Carrying guns in public can land offenders with a 10-year prison sentence. But police say punishments are rarely enforced. Politician Chuwit blamed an ingrained culture of taking the law into your own hands. “If a man can’t wear a uniform, having a gun is the next best thing,” he said.